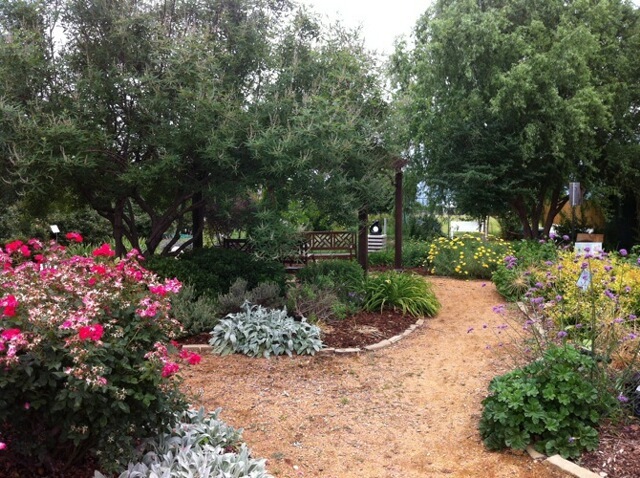 The Discovery Garden was created by the Rockwall County Master Gardener Association and demonstrates some of the latest research concerning recommended plant varieties for this area. The 1/3 acre project is comprised of numerous small ornamental and vegetable beds. Structure, texture, pattern, color, and balance are repeated throughout the gardens. Come visit the garden to see how the perennials, annuals and shrubs have adapted in a low maintenance, unhampered garden. It demonstrates the resilience of plants as well as the understanding that they are doing what they were created to do—provide beauty without a lot of maintenance from mankind. The KnockOut™ Roses and the EarthKind® roses continue to be an attraction for many residents and have provided great insight into their growing patterns. Study these trials to determine which works best for you. The roses were all pruned in February, 2016 to maintain shape. With the risk of rose rosette disease, all pruning follows recommended procedures. The beds at the Discovery Garden are prepped before planting and then mulch is applied in the spring and fall. Each garden has established plantings and a few new ones. Our intent is that you will see plants that perform well in our area with water constraints, high winds, and a wide variety of temperatures. Some plants have not responded well, and we would like for you to make note of these. Water harvesting tanks and vertical room divisions were added in 2009. This assists in helping homeowners visualize various concepts for their own respective gardens. Each season holds something different in store for the viewer. We recommend that you visit at least once a season. During the spring and summer months the garden changes so fast that we recommend a visit every two weeks. Guided tours of the Discovery Garden are available for groups of 20 or more. The garden also provides ample opportunities for senior pictures; engagement and wedding portraits; as well as family portraits. Call the Rockwall County Extension Office for details at 972.204.7660.